If you look for side sleeper guide online, you will see that there is one tip that is commonly given – use the right pillow. You should find a pillow that is supportive and comfortable, especially for the pressure points. In this case, one of the options that can be taken into account would be Sleep Better Beyond Down Gel Fiber Side Sleeper Pillow with three different options including standard, queen, and king. Is it going to be worth your money? Keep on reading and know more about this pillow. 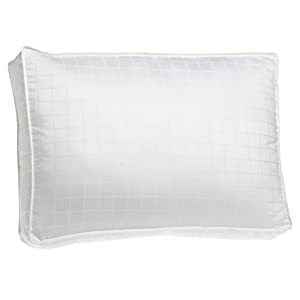 Made from Micro-Denier Gel Fiber: This is an excellent choice for a full-service support pillow. When complemented with the use of the best mattress for the side sleeper, it is surely going to minimize body pain and sleep disruptions. The use of this material is commendable because it is moldable and will adapt to the shape of the head or body of the user, allowing it to offer personalized comfort. Gusset Side Stitching: Another impressive feature of this pillow is the 4.5-inch gusset stitching on its side. It creates a frame that will make the pillow retain its shape, preventing such from collapsing even with an extended period of use. Therefore, you can be assured of its ability to keep your head secured in your sleep. 300-thread Count Cotton Cover: To make this pillow more luxurious, it comes with a 100% cotton cover, which has 300 thread count. It is going to be unrivaled when it comes to softness. 5-Year Warranty: As a demonstration of their commitment to manufacturing high-quality and long-lasting products, the manufacturer offers an extensive warranty coverage, which lasts for five years. Superior Neck Support: This is one of the reasons why it is perfect for people who sleep on their side. Stiff neck is going to be a thing of the past! The pillow is not only supportive but also very comfortable. Stays Cool: The gel fiber filling and the cotton cover of the Sleep Better Beyond Down Gel Fiber Side Sleeper Pillow is impressive because of its ability to maintain the right temperature. Even in the summer, you can expect to have a good sleep with this pillow. Extra-Large Size: Whether it is used as a head or body pillow, it can prove to be an exceptional choice. Its generous size allows it to provide all-around support, which is one thing that you cannot find in smaller pillows. Looks a Bit Stiff: This is basically because of the rectangular shape and the gusset stitching on the side. Some of its users noted that it looks like a brick. The edges can also be sharp. Can Get Flat: Gel fiber is a material that is not as superior as the others that are used inside sleeper pillows. It is prone to getting flat or shrinking as more pressure is applied to it. In sum, Sleep Better Beyond Down Gel Fiber Side Sleeper Pillow is a supportive and comfortable pillow. If you are looking for the best side sleeper pillow, this should be included in your list. It comes with a gel fiber filling and cotton cover. The manufacturer also offers the 5-year warranty. However, it may appear a bit stiff, and it can shrink over time.